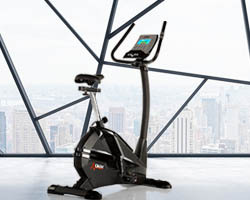 The AirTrainer XC-220i elliptical cross trainer is built to give you highly efficient yet joint-friendly workouts in the comfort of your own home. Motion on this trainer resembles that of running but without the impacts on your body that you get from running outdoors. 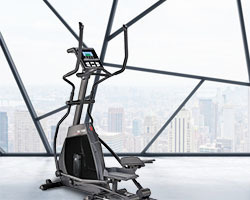 The hybrid body-balance design along with the curved workout arms have been perfected to ensure comfort for exercisers of different heights in a natural and ergonomic body position, which means that multiple users at home can benefit from exercising on this machine. Sessions will be very efficient too with you burning double the calories as before. The large stride length and very minimal Q factor combine to provide natural action and a much lower chance of injury, especially since the elliptical motion is very smooth thanks to the pedals that are on solid dual guide rails. There’s a selection of pre-set workouts on this trainer, with 4 beginner, 4 advanced and 4 performance ones to suit varied fitness levels and allow you to progress to harder levels as your fitness improves. The machine also offers popular high intensity training (HIIT) and you can perform HR workouts with the My Zone HR programming. 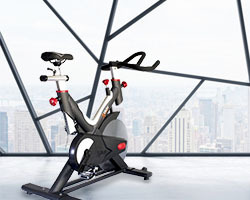 Find the right intensity using the 32 levels of air-magnetic motorized resistance and enjoy the cool air from the built-in AirStream fan as you up your performance. See all your feedback simultaneously on the NextGen display with its colour LCD screen that certainly looks the part. 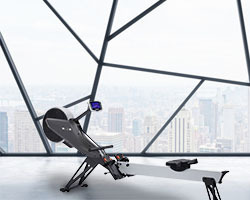 4 users can set profiles to get feedback tailored to them and you can work out using compatible apps thanks to Bluetooth 4.0 technology integrated into the trainer. 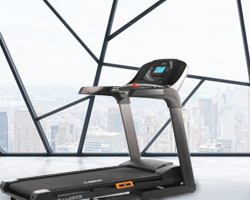 The AirRunner XC-220i – for effective zero-impact workouts on a quality piece of workout equipment.